You might often wonder, how the hell a palmist could tell when my marriage would be! Well, here is the step by step procedure of measuring the ages for significant (!) love and marriage. 2 Measure the distance between the heart line and the base of little finger. You should place the ruler by the side of your palm just the like the way as shown in the figure. Here you see, there are total 17 divisions. This length will represent 50 years life span of your life. 3 Now count the number of divisions for marriage lines. 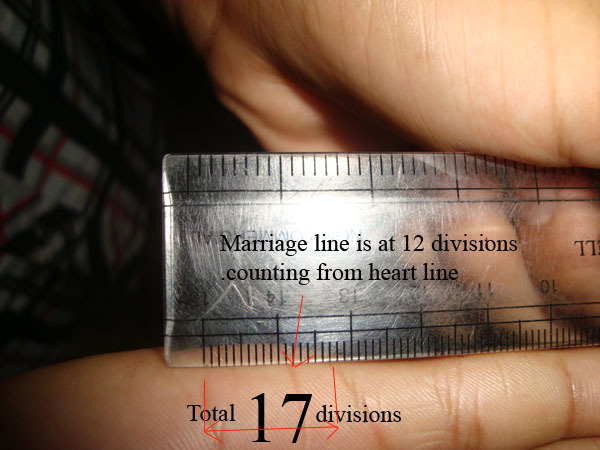 In case of this person in the figure, we see, the marriage line is at 12 divisions counting from heart line towards the base line of the little finger. So the age representing at 12th division will be his year of marriage. so the person will find his true love at 35 years age. Now this is only in one hand. To be more accurate, you must measure the age of marriage at your left hand too. Say, there are two marriage lines at 25 years and 35 years in your left hand. So the possible years of falling in love and marriage will be at 25 and 35 years. I have heard about someone married at 78 years age. I wonder, how could I measure her age of marriage! You have learned how to find out the years of love and marriage. But what will happen during the marriage, and after the marriage? Will the family life be peaceful? Will your relationship turn into a successful marriage? There are lots of other questions. I hope I will clarify these topics later. But for now why don’t you roll your sleeves and get down to measure your own years of marriage and of others? Cheers!